Today, on The Early-Stage Founder Show, I’m talking with Jay Gibb, the Founder, and CEO of CloudSponge, a SaaS startup, or as Jay refers to it, a feature as a service startup. CloudSpounge helps companies like Airbnb, Yelp, and GoFundMe tap into the power of address books to generate more leads and referrals. Jay has built CloudSponge as a developer-run, engineering-led company that is fully distributed and in our chat we’re going to hear how he’s done it. 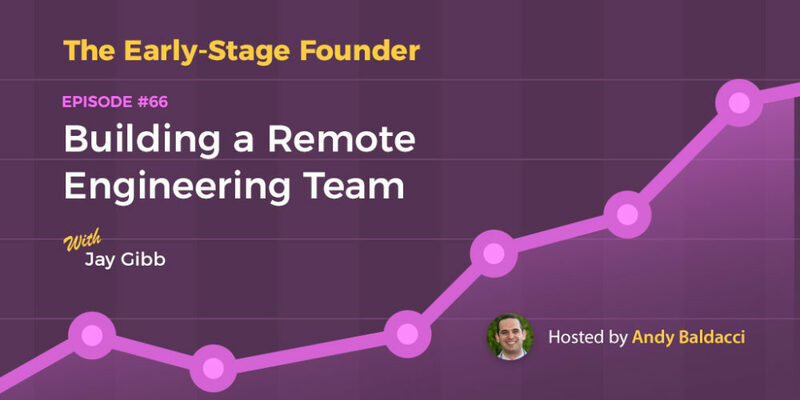 We cover everything from hiring to managing, so if you’re looking to build your engineering force using remote workers, then this is the episode for you. What is CloudSponge and how did it come about? What does the company look like today? Why distributed rather than centralized? Can you walk us through your hiring process? What goes into effective management of a distributed engineering team? Why is it important for you to have everybody do support? How do you limit the costs of context switching? Is this something that only applies in the early stages of a startup, or should it continue as they scale? What advice do you wish somebody gave you when you got started with CloudSponge? To learn more, head to CloudSponge.com, connect with Jay on LinkedIn, or tune into the show to get his email address.